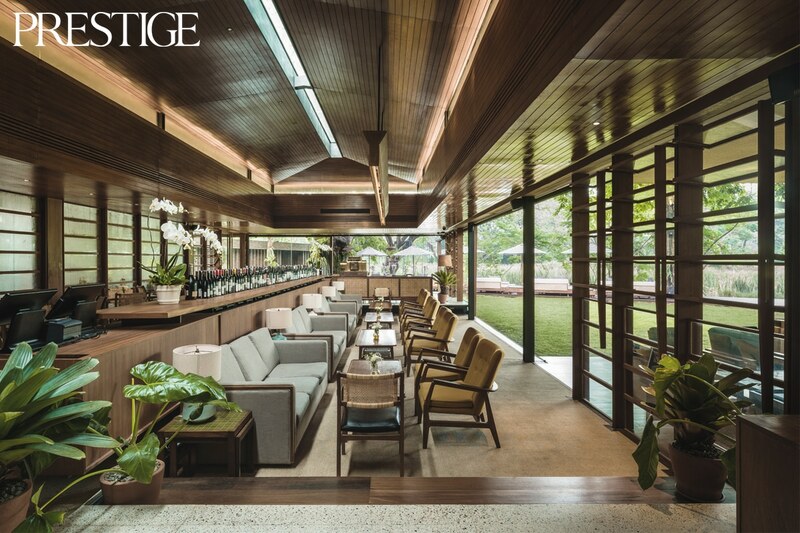 A sophisticated dining area and an ambiance surrounded by nature and, oddly enough, tranquility, sounds too good to be true in Jakarta. It’s not impossible, but indeed hard to find. But if you just take a step back for a moment, you will find a hidden gem in the busy Senayan area where you can relax and enjoy great food. A small street after taking a left turn from the main gate of The Maj will take you to Cork & Screw Country Club, Union Group’s latest addition to the brand. You realise right away that it’s a Cork & Screw just by looking at the design of the restaurant. The signature rectangular pattern and an extensive use of polished wood, brick and horizontal lines are the work of one of the country’s leading architects, Andra Matin. The “hardness” of the design contrasts beautifully with the green life outside. 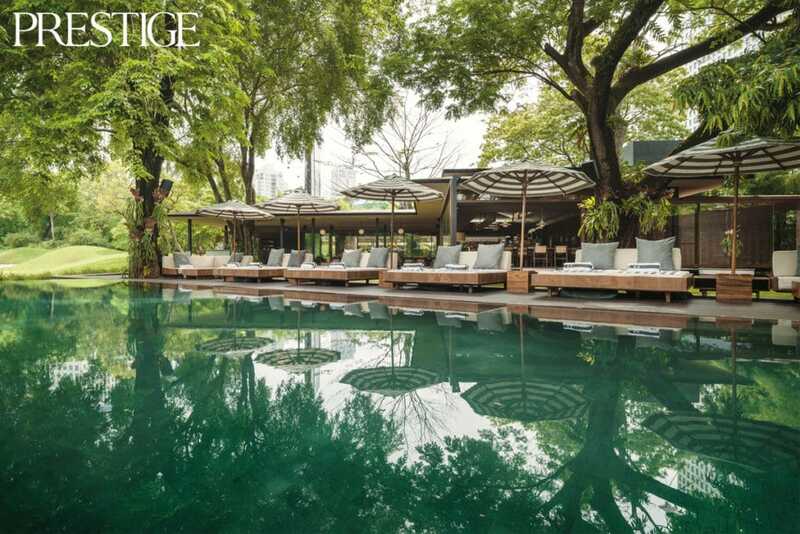 The establishment has indoor and semi-outdoor concepts, including a swimming pool and daybeds. You can easily find sofa seating to enjoy the company of your friends, while more formal 2-4 seating is also available for dining. Cork & Screw’s comprehensive menu consists of a wide range of small plates and appetisers, main courses, both Asian and Western dishes, grills and cheese and charcuterie. The establishment is highly regarded for its extensive wine list. One of the most sought after dishes, Nasi Cumi Pekalongan, comes with two kinds of squid, sambal ijo and belimbing wuluh salsa. 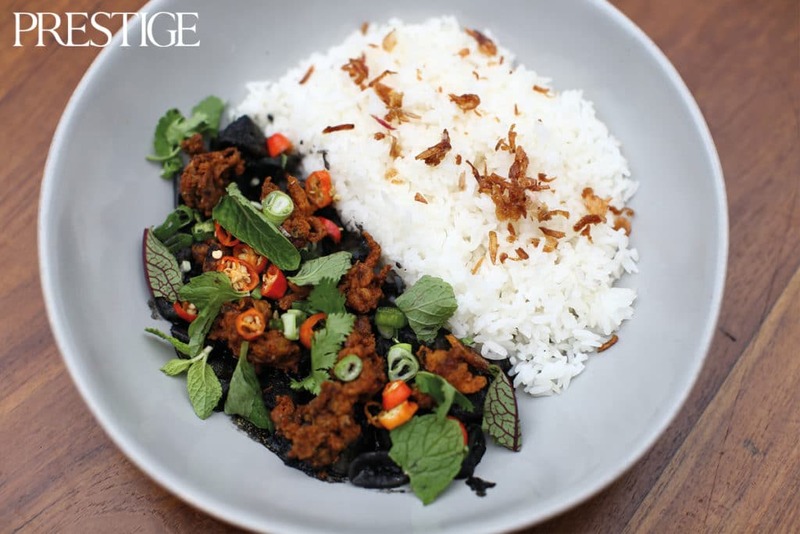 It’s a perfect blend of savoury and spicy that is always associated with Indonesian food, but not too overwhelmingly spicy as you can still taste the squid. Another Indonesian fare to try is the hearty Soto Betawi, a classic that’s always been a favourite to any Indonesian food lover, which features beef cheek, double-cooked tripe, crispy paru, tomato salad, melinjo crackers, crack broth, served with steamed rice on the side. If you want to eat a lot, but don’t want to feel guilty, Cork & Screw has Crispy Tuna Tataki Salad. 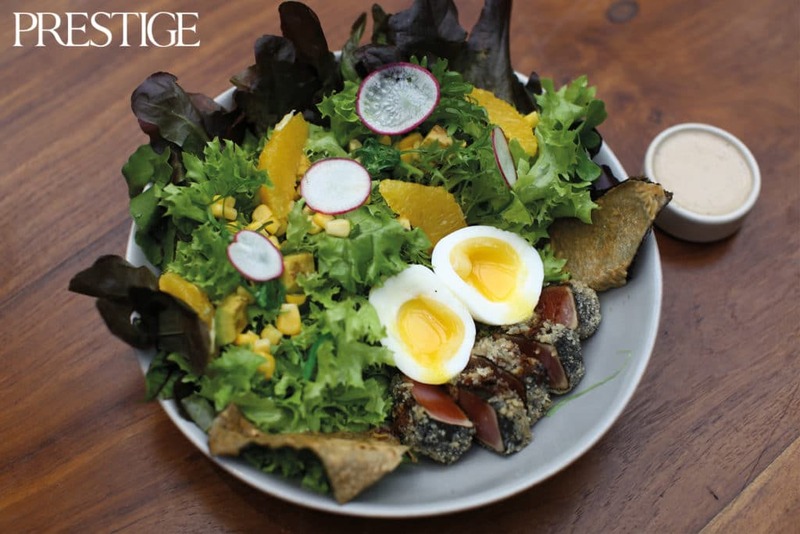 A bowl of goodness with heaps of mesclun, avocado, corn, radish egg, wakame nori crackers and topped off with truffle sesame dressing. The Crispy Tuna Tacos has almost the same flavour as the salad, with a tad more freshness thanks to the wasabi and ponzu. Moving on to pasta, the Chilli Cream Scallop Linguine is an interesting take on the classic carbonara. It features the garlic confit, grated cured egg and sprinkles of chili on top. While the C&S Burger is a classic burger with house grind patty, charcoal sesame bun, brie, emmental and gruyere cheese, French onion, thyme mayo and red wine onion glaze. Served with fries on the side, it’s the perfect meal to enjoy on the pool side. With a background in Spanish cuisine, Chef Fernando is also the person who created tapas menus for all Cork & Screw establishments. “Cork & Screw is known as ‘the wine place’, so everything here can be paired with wines,” he says. “I developed the menu together with our sommeliers, so you can simply ask our staff which selection is suitable with your meal. The bar area is stylishly designed with white marble, in contrast with the warm lighting and wooden table and stools. The bar offers a wide range of cocktails with bartenders offering interactive experience as they prepare the drinks. Here, the Bika Ambon Old Fashioned is a must-try made of bika ambon kraken rum, orange bitters and bika ambon crackers as garnish. Or if you are an adventurous drinker, try the Oxtail Sour Soup that is made of oxtail soup sous-vide grain spirit, lemon juice, kalamansi juice and young melinjo. It’s so easy to forget the city when you visit this establishment. It’s a place where you can bring along everyone from friends and business partners to your grandmother, and enjoy simple good food along the way.